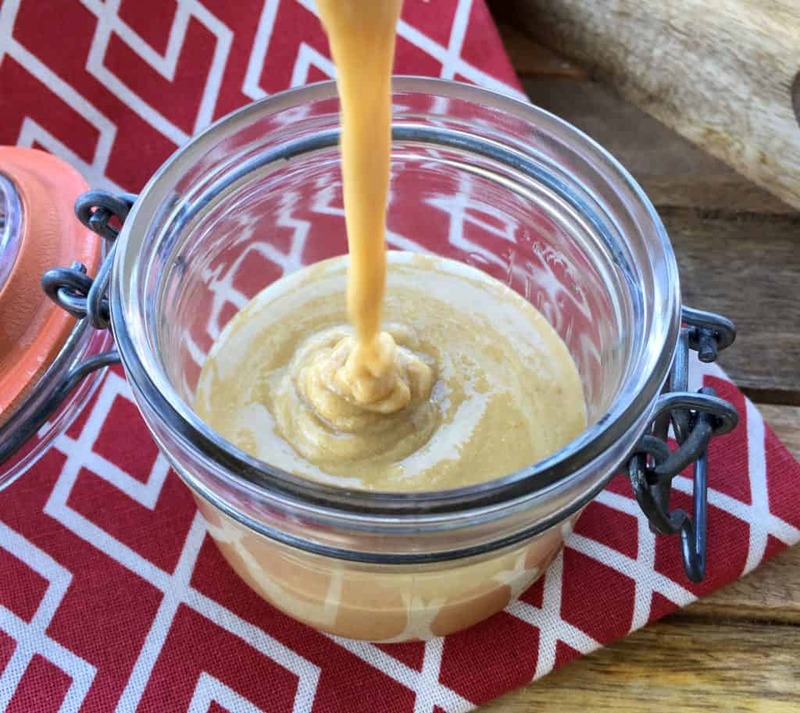 This authentic homemade tahini paste is so quick and easy to make, is less expensive than store-bought, and tastes WAY better! The scenario you’re all familiar with: Really in the mood for some homemade hummus. Garbanzo beans? Check. Olive oil? Check. Lemons? Check. Garlic? Check. Tahini paste? Dang it. Don’t let that stop you again. It’s super simple to make yourself and tastes even better than store-bought! Well, I was craving hummus and didn’t have any tahini on-hand, so I quickly whipped some up and made a fabulous batch of hummus with it. As quick and easy as it is to make, it’s rather pointless buying it at the store. For one, you usually end up with waaaaay more than you need and the rest often goes to waste. Secondly, it’s quite a lot cheaper to make it yourself. Thirdly, it tastes so much fresher and bolder! So quick and simple to make, tahini paste is simply sesame seeds that are toasted and ground up with olive oil to make a paste. So there really is no excuse to forego your hummus craving because you don’t have any tahini on hand. Just keep some sesame seeds on hand and you’ll always be ready to roll. * Tahin Pekmez is a popular dip in Turkey. It has the reputation as being the Turkish PBJ because it’s made with tahini (which has kind of a peanut-buttery taste) and grape molasses. Sound like a winning combination? It is! * In Greece it’s a popular condiment in which to dip pita and souvlaki (grilled meat kabobs). * In Israel it’s a staple topping for falafel and shwarma. It’s also used to make halva-like treats. * In East Asia in commonly used in noodle dishes. * Throughout the Middle East it’s used in sauces for meats and vegetables. As for tahini’s nutritional content: Tahini is relatively high in calcium and protein and is an excellent source of copper, zinc, iron, manganese, amino acids, and omega 3 and omega 6 oils. Those nutrients help fight inflammation and are provide great cardiovascular support. They also contribute to immune support. Just one tablespoon of tahini has roughly 26 percent of the recommended daily intake of copper and 9 to 12 percent of zinc, iron and selenium. Not bad, huh? This recipe uses one cup of sesame seeds which will make about 3/4 cup tahini paste, depending on how much olive oil you use. How much olive oil you use will depend on how thick you want the paste. You’ll need at least 3 tablespoons of olive oil and possibly up to 1/3 cup. *Shopping Tip: Buy sesame seeds in bulk. Buying the in tiny bags or cans with just a few ounces can be very expensive. 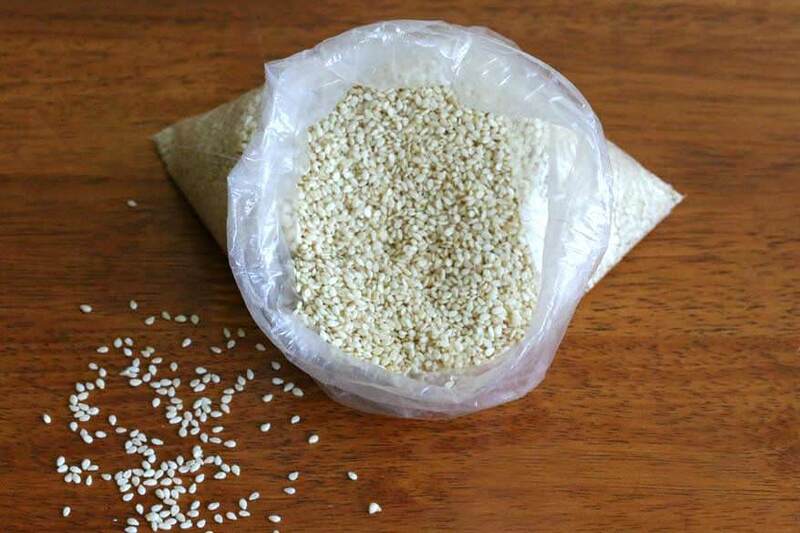 You can buy sesame seeds in the bulk sections of some grocery stores. Or you can buy them online here for a good price: HERE and HERE. Heat a clean, dry cast iron or heavy duty skillet over medium high heat and add the sesame seeds. Stir frequently until they begin to turn golden brown and then stir constantly. Be careful, sesame seeds burn very easily. You definitely don’t want burnt sesame seeds (they taste awful! ), but you do want them generously golden brown for optimal flavor. Once they’re toasted, let them cool a few minutes then add them to a food processor. I use and love Cuisinart’s mini prep food processor. With a 3-cup capacity it’s perfect for smaller jobs like this. We’ve had ours for over 10 years and it’s still going strong! Start by adding 3 tablespoons of olive oil. Process the mixture into a paste, scraping down the sides. Add more olive oil until you reach the desired consistency. If you’re using it to make hummus, the paste should be fairly thickly “pourable” (like in the main recipe picture above). Store the tahini paste in the refrigerator in an airtight jar. Will keep for several months. And now that you’ve made your tahini, you’ll of course want to make some hummus, right? RIGHT! Interested in other great homemade condiments? 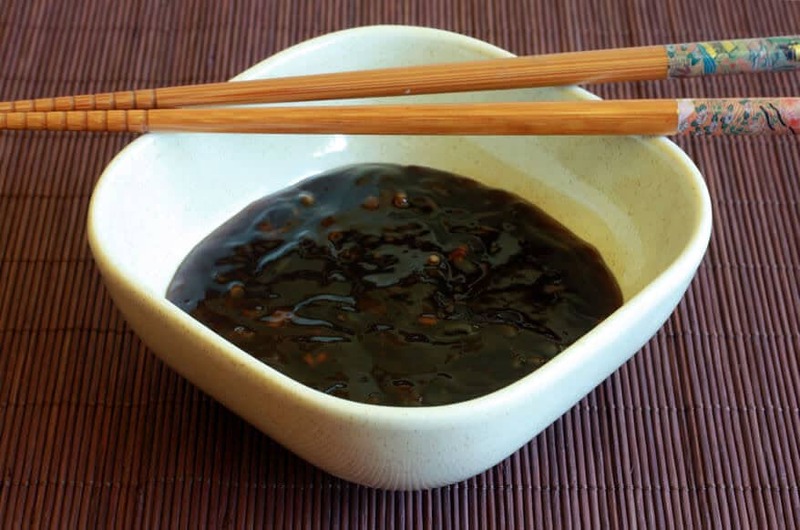 Try this BEST HOMEMADE TERIYAKI SAUCE! So easy and so flavorful, you'll never use store-bought again! Once they're toasted, let them cool a few minutes then add them to a food processor. Makes a little less than 3/4 cup tahini paste, depending on how much olive oil you use. * The texture may be slightly gritty, which isn't a problem, you won't notice it at all when you use it to make hummus for example. But if you want it a little smoother you can run it again through a high-powered food blender (I used my Vitamix). Kimberly, I am so glad you posted this. I had been planning to make tahini, but did not know it would require the addition of oil. All the nut butters I make don’t require anything beyond the nuts. I guess, given the fact of the existence of sesame oil, I’m surprised that there is any need to add oil to the seeds. Hi Susan, sesame seeds most definitely have their own oil content, but to achieve the smooth consistency of tahini paste, extra oil is added. You can omit it if you prefer (for a thick/rough consistency) but if you’re using it to make Middle Eastern dips, like hummus, you’ll have to make up for it by adding even more oil later, so it’s just as well to add it to the paste in the first place. On a side note, you can also use sesame oil instead of olive oil but be sure it’s raw and not toasted sesame oil or you’re Middle Eastern dishes will taste more Chinese :) Olive oil is what’s most commonly used though. Thanks, Kimberly. I will follow your advice. It would be a pleasure to make my own, because I’ll bet it would be much easier to stir than the stuff in a can (I think the brand was Aladdin) I used to buy at a Lebanese grocery in Los Angeles, many, many years ago. Sure thing, Susan. If you do try and make it without adding the extra oil and come out with a successful consistency, let me know. In olden days they would traditionally grind the roasted sesame seeds with a pestle and mortar and as far as I’m aware, wouldn’t add any extra oil. I think the key is probably super fresh sesame seeds. The ones we buy at the store have been sitting on the shelves for so long that their oil content has been largely dried out. So even “traditional” tahini recipes today call for extra oil. Made it!! I used it to make hummus – SO good! Thank you!!!! You’re so welcome, Brandy! I love how easy it is to make and how convenient when you need it last minute. That’s wonderful, Patricia, I’m so pleased you enjoyed it! The homemade tahini really does make a big difference in the flavor of the hummus. I’m never buying tahini again! Hi, can I use vegetable oil instead of olive oil? Hi Reen, yes you can! Thank you for sharing! Little suggestion from a Lebanese lady, Olive oil is delicious and I use it in gallons. But, for the Tahini paste, using peanut oil it’s how to be done! So, the texture of Hummus will not change, stays ETHNIC . I use tahini so much, I make Hummus, Mutabbal etc…. Try the recipe and let me know! Olive oil will go on top of the Hummus as a decoration and dipping purpose. I sprinkle cumin, paprika on the sides of my Hummus and I add my home made hot red pepper paste in the center, OLive oil on top, my guests stir it all together to start eating , I get little edgy :) and I correct them how to eat it! They laugh! Thank you! Hi Zovik! Thank you for your feedback – I really like the addition of the red pepper paste in the center. It’s interesting you mention that. My husband and I just got back from a trip to Los Angeles and I found a wonderful Lebanese bakery there. We arrived at the perfect time to find find the breads freshly baked and still hot. We tried several savory Lebanese pastries – filled with spicy meat and cheese. We also had two kinds of flatbread – one sprinkled with olive oil and za’atar (one of my favorite spice blends, I make my own) and another smothered with red pepper paste, dotted with black olives, and sprinkled with cheese. They were all delicious. I was able to chat with the owners for a while about Lebanese and Middle Eastern food. Next door was also a Middle Eastern grocery store. I wanted to pick up a bottle of that red pepper paste, but we had only brought carry-on luggage so we wouldn’t have been able to take it on the plane. But that’s okay, because I want to make some homemade anyway :) I was so thrilled to have found that bakery and grocery store just outside of LA. Such friendly people, a very well-stocked grocery store, and wonderful baked goods. Next time we go to LA, we’ll be stopping there again! Hello! So I tried to make Tahini paste with Sesame oil, it was AMAZING! But, peanut oil is cheaper! Friends, anyone needs tips for Lebanese cooking or infos, I love cooking, I feed my friends and give food to people constantly! My joy is to cook and watch people smiling while eating! Thank you! Hi Zovik, I’m happy you enjoyed it and thanks for your feedback! Here you go, Shahbano: http://www.daringgourmet.com/creamy-hummus-with-homemade-tahini-paste/. It sure is, Mark! Especially when it’s not only cheaper to make yourself but tastes even better than store-bought! Is there any reason why one cannot use raw sesame seeds in this recipe? Hi Jake, it’s the toasting process that gives the tahini its flavor. What is the difference between Chinese sesame paste and tahini? But my hummus was a little dry, think I left out too much chickpea broth. Haha, that’s awesome! It really is simple – and cheaper and tastes better. Yes, hummus always needs to be tweaked a little until you reach the consistency you want. If it’s dry simply add a little more liquid from the chickpea can or some more olive oil. I have a jar of already toasted sesame seeds. Will that affect the taste of the tahini? Hi Lynn, it won’t be quite as flavorful (fresh roasting makes a big difference) and you may need to use a little extra oil since some of the natural oil in the jarred toasted sesame seeds may have been lost. Other than that, you can definitely use them. I avoid vegetable oil like the plague that it is, Bob, and peanut oil isn’t much better. Definitely, olive oil is much, much healthier. As long as your diet approves of legumes, then yes, hummus is a fantastic, healthy snack to add to your regimen. 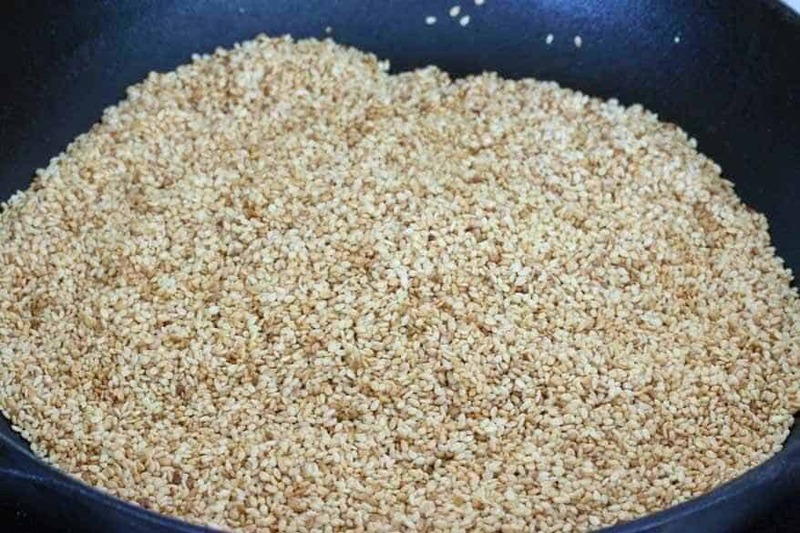 Tahini is made using ground sesame seeds. It is additionally called sesame glue or sesame spread. It is similar to nutty spread yet produced using sesame seeds. There are a few accessible choices when you buy tahini. The principal thought in terms of picking a tahini is whether to buy an item produced using unhulled or hulled sesame seeds. Tahini produced using unhulled sesame seeds is more supplement rich than tahini produced using hulled seeds, however it is likewise bitterer; this sort of tahini is typically alluded to as sesame spread. Since both renditions would even now settle on for good sustenance decisions, you can let your taste buds choose which sort the one produced using hulled seeds or the one produced using unhulled seeds—is all the more satisfying to you. Thanks for the information, kobimedya! That was my understanding as well, that unhulled sesame seeds would yield a more bitter flavor and, being unhulled, also wouldn’t toast as nicely. But certainly, for anyone who prefers the more bitter flavor unhulled seeds can be used as well. Thanks, Funmi! I’m a huge hummus fan, too, and being able to make your own tahini is indispensable! What is it supposed to taste like. I didn’t add any salt, toasted the hulled sesame seeds, added 3+2 tbsp olive oil and I find it very sesame seedy in flavor but not very tasty. Even slightly bitter. Is this right? Should I have added salt or some other seasoning. With salt I bet it would taste really good. I’m going to use it in Hummus. I’ve never tasted Tahini before, so I’m kinda in the dark. Please let me know if I did it right. Thanks! Hi Brian! Yes, it has a very strong sesame flavor and is slightly bitter. It’s definitely something I wouldn’t enjoy eating on its own. But just wait until you add it to your hummus – delicious! I added it to my slow cooker chick peas and made hummus. The hummus was wonderful. Thanks! Excellent, thanks for your feedback, Brian! P.S. My sesame seeds roasted looked exactly like your pictures. The thickly pour-able texture was also achieved. I’m just unsure of the taste. Thanks! I’ve made this tahini paste three times now and it’s perfect, taste and texture. The flavor is robust and makes my hummus taste better than it ever tasted with the store bought tahini. I’ll never buy store bought again, this is so quick and easy to make and tastes so much better. Thank you! Awesome! It’s true, nothing beats homemade for flavor. So happy you like it, Cathy, and thanks for the feedback! If you buy the seeds in bulk, can they be frozen to keep longer? I love hummus, but my husband is not a big fan. Hi, Carolyn! Yes, the seeds can absolutely be frozen in an airtight container or bag. Hi thanks for the recipe, I’ve been searching for tahani in all our local supermarkets for over a week now as, yeah you guessed it I’m making humus!!! Thanks again. Awesome! So happy you found this, Sarah – happy tahini and hummus making! I have brown sesame seeds. Your picture looks white, does it matter? I’m looking forward to making tahini and hummus from your recipes. Hi Carolyn! It sounds like what you have may be unhulled sesame seeds. You can use those as well, but they’ll impart a slightly more bitter taste. Once the tahini is mixed in with the hummus that will help temper the bitterness though. One of the backbones of Middle Eastern food is tahini, a ground glue produced using sesame seeds. In Arabic and Hebrew, it is known as techinah, while the Turkish word, tahin, is clearly nearly related. The base of the statement seems, by all accounts, to be an Arabic word signifying “to pound,” which is likewise utilized as a base for different words portraying ground nourishments, for example, flour. Dissimilar to sesame glue, a famous fixing in Asian food, tahini is produced using sesame seeds which have been hulled, so it is a more refined item, and it likewise has less healthful quality, as the external packaging of the sesame seeds has been uprooted. What’s more, tahini has a tendency to be lighter in shade than Asian sesame glue. Thank you for the great recipe and all the information. In addition to the olive oil, I used a small amount of Meyer lemon oil. I love my hummus garlicky and lemony, so that little addition of the concentrated lemon oil really brightened the Tahiti up. The addition of the Meyer lemon oil sounds great, thanks for the feedback! My husband is on a diet….what is the calorie or carbohydrates per serving….what is a serving…. I thought this would be a great snack with some taste to do the Hummus with some grilled veggies…. Hi Donna, I haven’t figured the calorie/carb content. The easiest way to figure it out would be to visit a website like “calorie count” or “fitday” and enter in the ingredients. It will give you a complete breakdown of the nutritional content. Hi Andrea, yes, it sounds like you just need a little more oil. How fresh the sesame seeds are can impact how much oil is needed – the fresher the seeds the more natural oils will still be in them. Some stores carry seeds that have been sitting on the shelves or in warehouses for a long time and their natural oils dry out over time. how long will the tahini paste last? Would it need to be refrigerated? It will keep for several months – refrigerated is best to prevent it from going rancid. I’m soo going to make this…been looking for Tahini paste all day. Awesome, spicycook! Let us know how it goes! Hi! Is there a difference between using white sesame seeds and black sesame seeds? You can use either, but the black will obviously dramatically change the color of the tahini and whatever else you’re using it in. I have not tried it with black sesame seeds and so I can’t vouch for any flavor differences. But white sesame seeds are what are most commonly used for tahini. This is going to sound sacrilegious but if you are on a crazy tight budget and cannot afford Olive oil and the stupid stores won’t bring the 1L bottles down to 4$ so its in your budget. You CAN use canola oil to make it. Olive oil is much healthier and gives it a nice flavour but don’t let your budget keep you down. I made it this way and made Hummus from scratch with it(Including using dry chickpees and cooking them in the slow cooker) and it came out delicious. Hi Camille, thanks for your input! You know though, I’ve see lots of brands of olive oil that are no more expensive than canola oil. I always marvel how expensive canola oil is such awful, awful stuff. Yes. Made it. Terrific. Made Hummus with it with Ina’s recipe. Awesome, glad you liked the tahini, Sherri! Nothing beats the flavor of homemade, the flavor is so robust! Can you put the sesame seeds in with the chickpeas and process them all together at the same time to make the hummus? Hi Kendra, good question! The tahini is super duper concentrated and I don’t think you’d get the same amount of flavor by adding sesame seeds to the chickpeas. Plus, I think the biggest problem would be texture – it would be more difficult to get a smooth consistency if you’re not processing it separately. My fear is it would be really gritty. If you try it though, let us know how it goes! When toasting my sesame seeds I think I may have let them get too dark? The paste tastes sort of bitter (and I’m not sure if it’s a normal tahini flavour or literally a “burnt” taste). I stirred and stirred the seeds in the pan but had trouble getting them to all brown evenly. Would I have been better to quit while some were still very pale in order to keep others from getting too dark brown? And is dark brown pretty much “burnt” when it comes to sesame seeds? Hi Carol, yes, dark brown is burnt. But the paste is going to taste somewhat bitter anyway (ie, it doesn’t taste good on its own, only when it’s mixed in something). Yes, with the next batch you’ll want to quit toasting them sooner, even if not all of them are light brown (that’s okay). It takes a little getting used to – sesame seeds take a little while to start changing color but once they do they go really fast! Thanks, Jalane! Yes, by itself it’s very strong. It’s a condiment that’s meant to be added to other foods – then it tastes amazing! OMG. I meant the hummus was too strong… I made the black bean kind and it was too spicy for me and my husband. so I ground up another can of chick peas, and added it to my hummus. . Then last night I added a TBL. of tahini to 1/4. C. of hummus and it was great as well. I used piita chips then some Trisksit. crackers. But my husband says the grands use fresh bell peppers, carrots, celery, cucumbers, any fresh veggies, and dip to their hearts content. With so many children I try to have fresh fruit and veggies when they visit.. Thanks very much, Kimberly! I’ll err on the side of lighter with the next batch. You’re so right about how they seem to do nothing for several minutes, then change fast! Thank you for sharing this super easy to make recipe! I will use this the next time I am craving hummus! Is this the same way to make it if you are going to make Halvah? :D Or does it have to be thicker/thinner? thank u for sharing soooo easy recipe.. made it nd it was PERFECT..! Fantastic, hina, I’m so glad it was a success and appreciate the feedback, thank you! Thinking to make a paste with sesame , date palm and coconut and honey , that I would like to use for a fruit cocktail will this be suitable? Hi NS, it’s very difficult getting the tahini perfectly smooth which would leave the cocktails with a gritty texture. In this instance, using tahini for drinks, I would recommend using store-bought tahini paste which will probably be a bit smoother. NS, I know very little about mixology but I don’t see why not. I love how much more cost effective homemade tahini really is. It can be so expensive and not taste nearly as good! I’ve never thought to make my own tahini! I love it though! Hummus is not the same without it! I love tahini, but I’ve never made it from scratch. So easy and simple, thanks for sharing! I love using tahini and it’s amazing how easy it is to make at home – I always have those ingredients on hand! Why do I buy this!?!? Looks so simple to make! How long the hummus will last in the fridge? Hi Lita, most sources say up to 7 days. I haven’t tried it, but I’ve also read it can be frozen for several months. How smart is this to be able to make your own! You are so right about the jar of old tahini that rots in the back of my fridge. Love this! It’s so much cheaper to make your own versus paying upwards of $10 per jar! Exactly, Lauren, not to mention it tastes so much better because it’s so fresh and full of flavor! I am OBSESSED with tahini. I have never made my own though. I think this needs to change. Thanks for sharing!! Jenna, it TOTALLY needs to change! Seriously, make this once and you’ll never get store-bought again! It’s the BOMB! Tahini is one of my favorites and I never actually tried to make it. Now with your super clear steps and demo I am going to try! Thanks! It’s soooo easy, Nic, and I’m pretty confident that once you try it you’ll never buy it again! I’ve always meant to make my own, this just might inspire me. Thanks! AWESOME! This is the first time I’ve made tahini paste thanks to you and it turned out great. I agree with you, my hummus tastes better than it ever has with this homemade tahini, much more flavor. Thanks! That IS awesome, Nate! So glad you enjoyed it and thanks for the feedback! Don’t just use tahini for hummus. It makes a fantastic salad dressing! Water, garlic, lemon juice are the basics, after that it depends on what I’m in the mood for. Tonight I think it will be ginger and a touch of tamari. It sure does, Daniel! It’s pretty versatile. 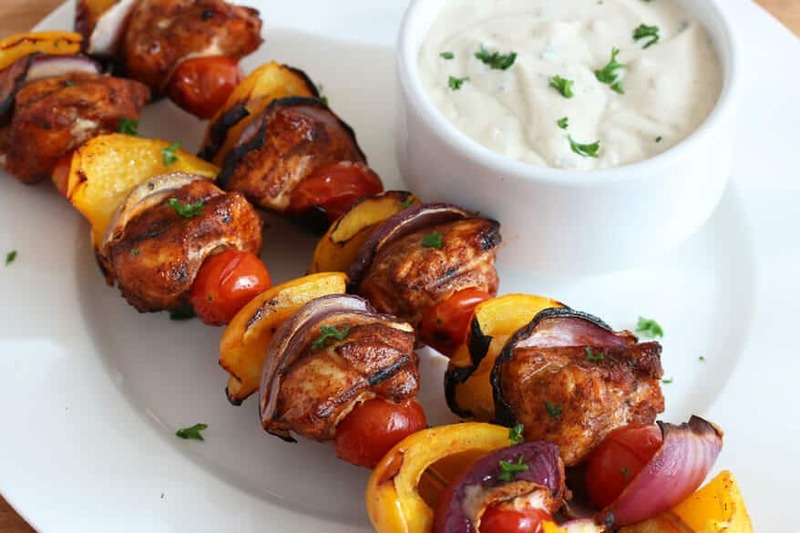 It’s also great on grilled chicken like my Spiced Chicken Kabobs. I used to put off making hummus due to lack of tahini, but it’s not really required to make the hummus. Think about it, you are adding oil to the tahini, then adding oil to the hummus. 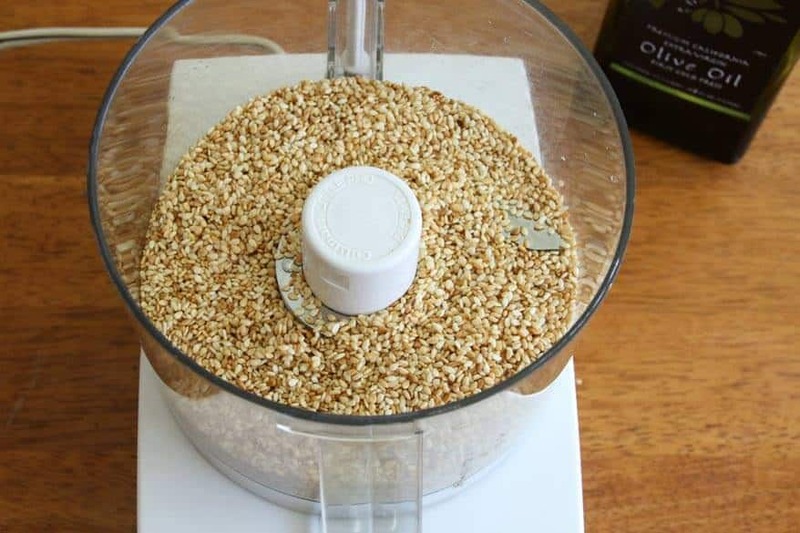 Instead of tahini, I simply toast raw sesame seeds in a light nonstick pan, then grind them in a coffee grinder until it a fine, slightly wet powder. Add a little extra oil to your hummus and you wind up with a delicious sesame taste without as many steps. Hmmm, how is that saving you any steps? You’re still having to toast the seeds and you’re still having to grind them. Whether you grind them on their own or grind them with some oil it takes the same amount of time. But the advantage of tahini is that you now have a condiment that you can store for a while in your fridge to have on hand when you need it – now that will save you a great deal of time for your next batch of hummus. If you process the sesame seeds too long with olive oil they turn bitter. You can cut the bitterness with balsamic vinegar. Hi Carolyn, thanks for the info. I’ve never heard that before nor I have I experienced sesame seeds turning bitter the longer they’re processed with the olive oil. I’m not really sure why the length of time would impact that at all. Can you elaborate? How does the length of time that you blend the seeds with oil affect the bitterness level? I have to say this is an awesome idea! 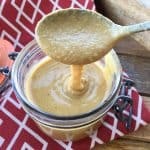 I used to have a hard time finding tahini paste but I am so going to try making my own! My hummus was heavenly with your homemade Tahini! mmmmmm! thank you! That’s wonderful, Katja, I’m happy to hear that, thank you! I’ve made this tahini paste twice already and it is fabulous. Will never buy the stuff in the store again. Thanks for a great recipe and step-by-step instructions. I found your recipe while searching the internet because I didn’t have any tahini on hand and didn’t want to make a run to the store. It worked like a charm. I’m not buying it anymore, this was quick and easy. Glad I found your recipe, will be making it from now on, thanks. That’s awesome, Chris, thank you! Thank you so much for the Tahini recipe. I used it to make hummus! And it came out wonderful! Will be using it in my blog. Thanks, Swati, I’m so glad you liked it! If you publish the recipe on your blog I’d really appreciate a link back to my site page. Thanks again for the feedback! I am glad I saw this website. I had no idea that tahini can be made this way. My question, which may surprise you, is: would you have the proportional measures for making tahini in bulk form? Like by the gallon? Or is it more economical to just buy it? Hi Emile, it’s cheaper to make it yourself, no matter the quantity. This recipe makes roughly 3/4 cup and there are 16 cups in a gallon so you’d simply need to multiply it that many times. Thanks much, Kimberly. The reason I asked is because some recipes should be multiplied by two or more. I am glad I asked. Just a quick comment on peanut oil, it is healthy and not to be avoided, as nuts help reduce LDL cholesterol. I will be making the tahini as I make my own Humus so it would be good to do everything from scratch. I have even grown some chickpeas, but I don’t really have the climate for them. Also I make my own peanut butter so I can control the salt and not add any sugar. It’s very similar to making tahini. Hi David, peanut oil’s only a problem if it’s used for high heat cooking because it’s too high in omega-6’s. Here’s a comprehensive guide on cooking oils we’ve published here and it gives the fatty acid breakdown of each: http://www.daringgourmet.com/2015/02/13/a-comprehensive-guide-to-cooking-oils-the-good-the-bad-and-the-ugly/. 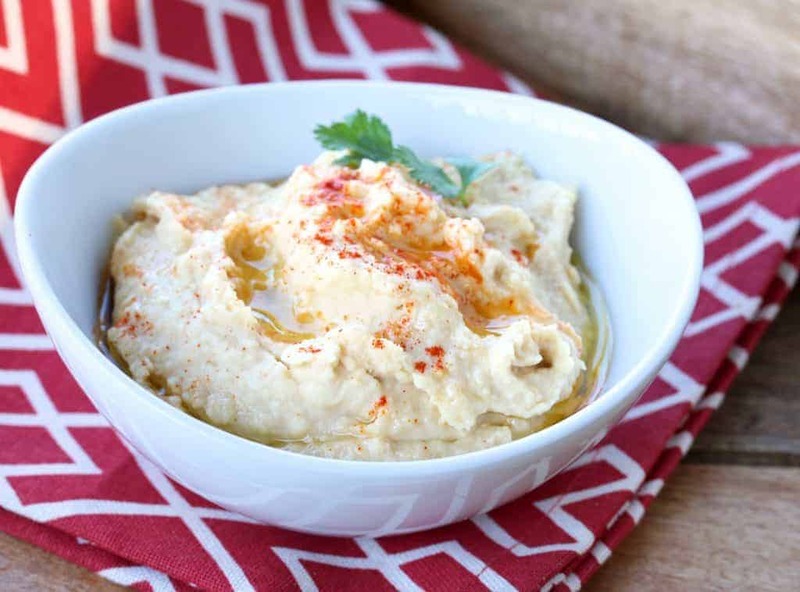 Agreed, homemade tahini and hummus is the best – no comparison! 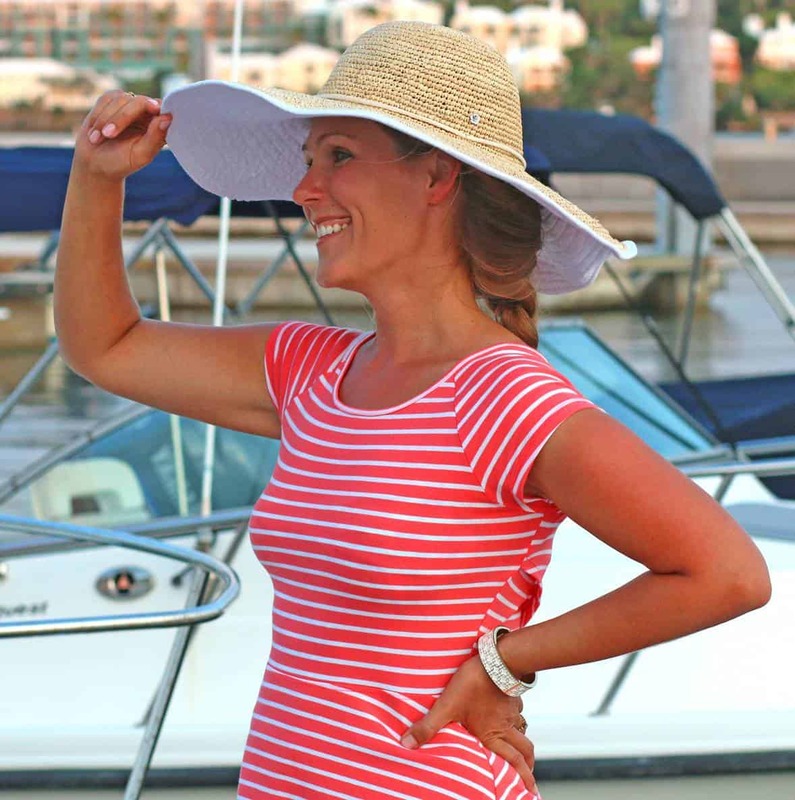 Hi Jeanna, I’m so glad you found us too – welcome! You’re going to love your Vitamix. I seriously couldn’t live without mine. Absolutely yes, you can make this in your Vitamix, in fact you’ll get even better results using it. The only thing is that you’ll need to double this recipe because if you make a smaller quantity like this it won’t process properly in the Vitamix. That’s the problem I’ve encountered when I’ve tried making really small batches of things in my Vitamix. That’s not really a problem though if you’re going to make hummus regularly, plus tahini lasts quite a long time. I enjoy hummus and am trying to find recipes that I can make. Upon stumbling this article, I have to say this. This looks and sounds amazing; however, I have an extremely small food processor, no blender, no hand blender (I do have a hand mixer and a whisk), or any other way I can think of to make this or the hummus. My food processor will hold maybe 1 cup of product. I also do not have a cast iron skillet, or a heavy duty one either. Neither can I afford to go buy said products. 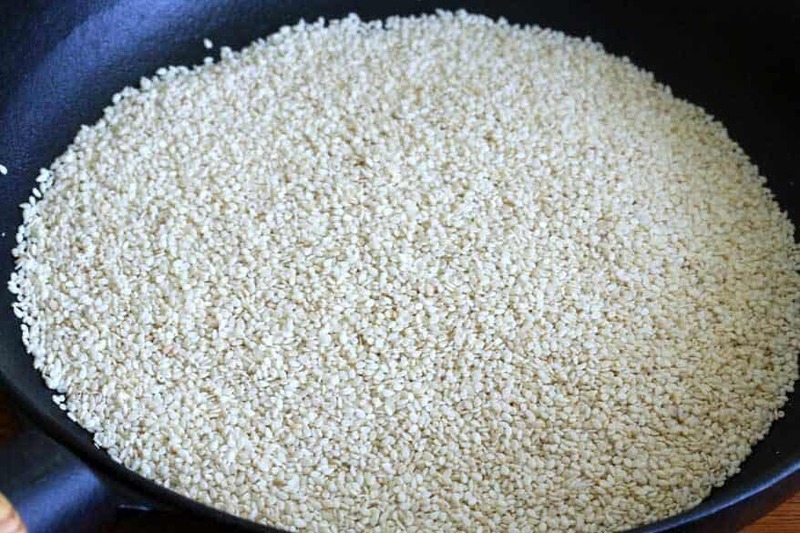 If I toast my sesame seeds in a small copper skillet and process them in my overly small processor by cutting the recipe in half, do you think this would work out fine? Hi Kris, that’s no problem at all. Absolutely, you can toast the sesame seeds in your copper skillet. Just watch them very closely towards the end, they burn very easily and very quickly! With your food processor, yes, you can either halve or quarter the recipe, or I would simply process the ingredients in batches, a bit at a time, however much your food processor can hold. Then dump the processed hummus in a big bowl and give it a good stir to make sure everything is equally distributed and you’re good to go. Absolutely perfect! I’ll never be buying tahini again, this was so quick and easy to make and tastes awesome in my hummus, dips and salad dressings. Thank you! I don’t think anyone enjoys eating tahini plain, Chris, only added to other things. But if your particular batch is as bad as you say then you probably scorched the sesame seeds which makes them really bitter. I am so happy to find your recipe. I have only found tahini in an Indian super shop, and Bin Inn (no frills take own container shop),in Christchurch, New Zealand. I use tahini in such a different way as to what people normally use it. When I make a sandwich or have toàst I use it instead of butter or margarine. Then àdd my filling:salad; maybe Marmite (yeast extract); nice with cheese, even meats and fish. Hi, although I would never use canned or bottled chick-peas, I use commercial Tahini paste. To reduce the cost, I bought a 3kg tub, catering shop. Now, this Is distinctly brown colored rather than the tan color of supermarket jars, and the oil is a darker color as well. I think that this will have bee made from whole sesame and sesame oil…or the seeds were toasted deeper than your recipe. It results in a full-flavored hummus, flavor being nutty. I use walnut oil which has a very light flavor. When the 3kg tub runs out, I shall try your recipe. Thanks. Hi Septimus, yes, give it a try and let us know what you think! I wish i never found this recipe….because now, store ought hummous suddenly taste like cardboard!! This one is so delicious. Awesome, Eric, I’m so glad you approve, thank you! It has never occurred to me that I could make my own tahini, so this is a first for me. The hummus using the home made tahini is absolutely wonderful; quite a different flavour from purchased hummus. (I used canned chick peas.) Thank you so much for sharing it. I’ll never buy hummus again. Yay! I know, Chloe, it’s soooo easy and the flavor is even better! PROBLEM GRINDING SEEDS? I always struggled with grinding the sesame seeds. My 4 cup Cuisinart didn’t do the job as it was too big. I toasted the sesame seeds, then ground them dry in my Nutri Bullet with the seed grinding blade. This produces the fine powder we’re . I added oil to the powder and processed that in the Bullet. This also allows me to make smaller batches as I use only 3 tablespoons tahini in hummus (per 1 can garbanzo beans). Thanks for the tip, Jean! Just one question: why would you use something like olive oil that will affect the flavor when logically you should use sesame oil? It really tastes nothing like regular sesame paste when you do that. Props for the method, though. NEVER USING STOREBOUGHT AGAIN! This stuff is amazing. I’ve already made 3 batches of it in the past month and can’t get over how easy it is. I use it regularly in my homemade hummus (using your hummus recipe) and I’m addicted. I loved the nutty flavour of this recipe. I used 4 tbsp of olive oil in this recipe and it turned out perfect. It almost looks like peanut butter. I used it in a recipe for a buddha bowl and it tasted so flavourful. Thank you. Fantastic, Nikki, I’m so glad you enjoyed it, thank you! Never ever EVER buying tahini paste again! This was so easy to make and gave my hummus a boost of flavor unlike any storebought tahini I’ve tried. Awesome recipe! So I was wondering if you could freeze tahini paste? I freeze my pesto in ice-cube trays for serving size portions and wondered if I could do the same with this recipe and have it last longer. This was just short of a lifesaver for me since I can’t find Tahiti anywhere where I live (and very few people who know what I’m talking about when I asked about it…). Even finding the sesame seeds in this amount was a stupider chore than it should have been. But anyway, now I can finally make a growing list of recipes I’ve been sitting in because I couldn’t find tahini pre-made, and was too irrationally stubborn to buy it online. The recipe -how it came out for me, at least- came out far too thick. I’m talking cookie dough consistency, only gritty, dark-ish and of course, bitter (which is the only part I expected). It was so thick my first (test) batch may have made the motor on my food processor smoke a little. I can’t decide if it was that, or if the sesame paste itself started smoking. I added a little bit more olive oil after that, like the recipe hints at doing, but it really didn’t change much. And since I didn’t want to overpower the whole thing with olive oil flavor, by putting too much in, and defeat the whole point of what I figure tahini I should be, I had to come up with another solution. So I quickly decided to get the consistency straightened out with water. I filled up a 1 cup Pyrex measuring cup and drizzled in a little water at a time till it thinned out to the way it appears in the pictures above, and how I’ve seen it in cooking shows (Milk Street drizzled tahini into brownies in this weekends episode). By the end of all 3 batches I made today, I used a total of 1 and 1/4th cups water, but I’m sure the amount will be different for everone/batch with this problem. The water had other perks than just thinning everything out. 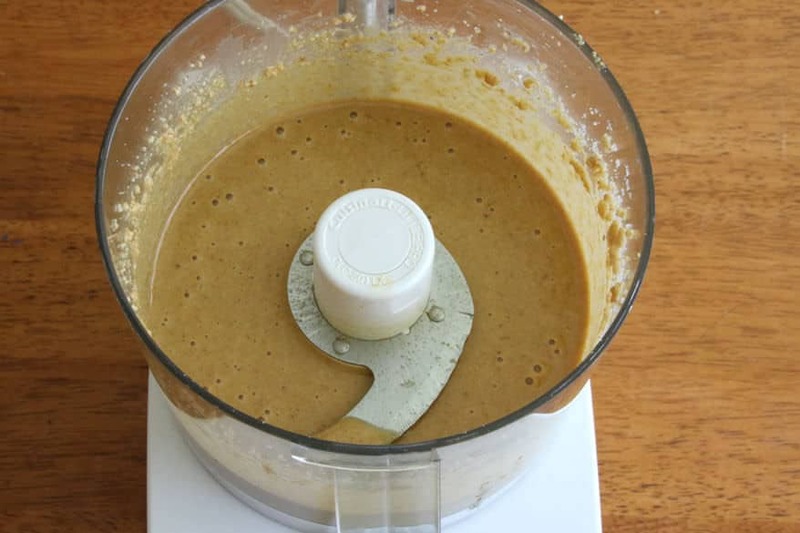 The added water helped the food processor work out the grittiness that wouldn’t work itself out when the moisture wasn’t present, greatly improving the texture of the tahini. The water also improved the color of the tahini; where the pre-water paste was dark, the post-water paste was lighter and much more like the color in the pictures above. It also helped the flavor quite a bit, evening the flavor out while leaving it still the right amount of bitter with a hint of olive oil, without it being the big POW of bitterness it was when it was a dark concentrated doughy paste. Oh and I’m pretty certain it won’t separate (I looked at it a few hours ago and it was fine), in spite the oil and water situation. I’m fairly sure the food processor and probably the presence of the sesame emulsified everything together. Greetings, after you complete the process of making tahini is refrigeration required? If not how long will et last in room temperature? Hi, left unrefrigerated it will depend on the temperature of the room and the oil itself. You can definitely taste when oil goes rancid and that will be the best indicator to go on. Refrigerated tahini can last for several months and again, you’ll know by the taste if it’s rancid. The nutritional information is scary…..indicates over a day’s worth of calories for one serving? What is the size of the serving? If the information is for the entire batch, how many servings and size of servings? Hi Toni, it’s for the entire batch. I’ve just adjusted it to show per tablespoon – serving size is going to vary depending on what you’re using it for or in. 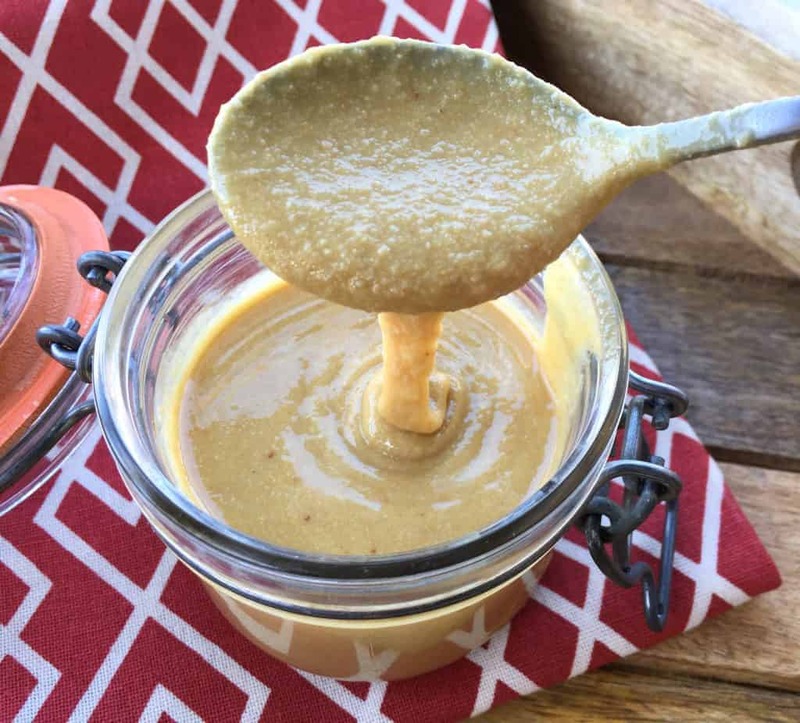 This tahini from scratch is insanely delicious! A flavor explosion and better than any tahini I’ve ever had before. I used unhulled instead of hulled organic seeds and it worked perfectly. Thank you. I will never buy store bought tahini again! Thanks!! I used this recipe (I only needed 2T) to make a dip with almonds, spices and lemon juice. I can’t wait to use it in other dishes as well. That’s awesome, Carol, I’m so glad, thank you! Hi. Can I use unhulled sesame seeds and replace olive oil with cold compressed coconut oil? Hi Pearlyn, sure there’s no reason you can’t do either, just know that it will greatly impact/alter the flavor. I used a coffee bean grinder to turn the seeds into a flour. Made the tahini much smoother. Fantastic, thanks so much for the feedback! Thank you for the recipe! It was the first time I made tahini and also the first time I tried it. I don’t know why, but it is a little bit bitter (I made it with olive oil, but alone it tastes good). I’ll make again again..
Great, Anthony! Yes, tahini is bitter and that’s normal. It isn’t meant to taste good alone, it’s when it is added to something, like hummus, that it tastes amazing. I’ve made tahini as well. The same as you outline. But I get lazy when making hummus (even though it’s so easy) and sometimes just use sesame oil using a slightly thicker garbanzo paste. I actually have an oil expresser (since i can’t get sesame oil where I live) and it gives a nice flavor. Just don’t use the dark kind if you buy it.